One of my favorite, childhood memories is eating cool crisp cucumber slices on homemade bread slathered with mayonnaise. My mom could raise just about anything but she really got a ton of cucumbers out of the dozen or so plants she put in the ground every spring. When Mom was gardening (way back in the 50’s and 60’s), there wasn’t a slew of choices when it came to what you put in the ground. Cucumbers were cucumbers. Today, there are a whole lot of varieties that you might want to try. Like tomatoes, cucumbers come in two varieties – hybrid and heirloom. There are three general categories or types of cucumbers, too, slicing, pickling and burpless. I’m an equal opportunity cucumber person. I grow and eat them all. But if you’ve got a yen for a certain type of cuke or a bit less space than you’d like, it helps to know just how big the plants will get and what type of cucumber you will harvesting. Let’s start with the ones that most people buy in the grocery store, the long green slicing cukes. There are a couple of varieties that have gained popularity in the last few years. Burpless Cucumbers – burpless cukes are, according to researchers in the Department of Horticultural Research at North Carolina State University, actually Oriental Trellis cucumbers. And they are a little less bitter and a little less prone to cause burping. Whatever you call them, these sweeter, long hybrids grow well on trellises and are a nice addition to any garden. But remember, this is a hybrid so seed-saving may not work. 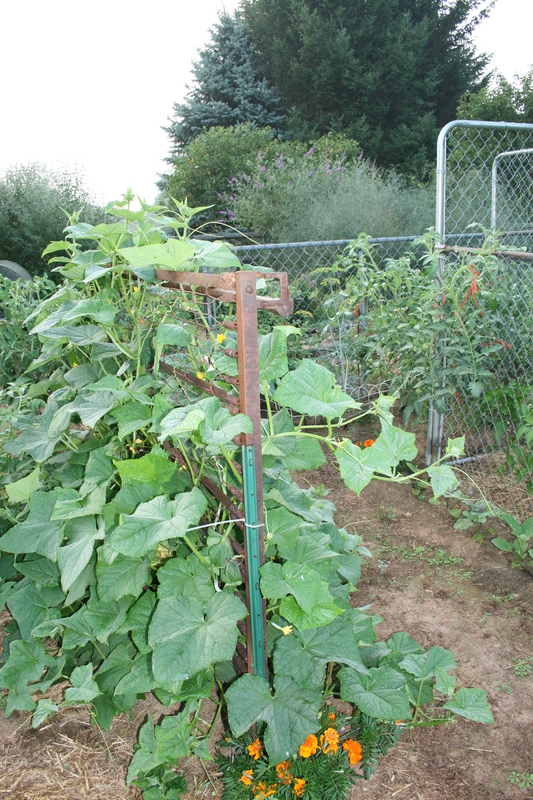 Marketmore 76 & Marketmore 80 – this cuke likes to have a trellis to climb, too. I use an old box spring for my cukes. Like the burpless cucumber, Marketmore cukes are dark green and straight (unless they grow through a bit of the bedspring) and quite tasty. And, they’re disease resistant, too. Straight 8 – another dark green, cuke that grows long and straight (hence its name) is a wonderful slicing cucumber. It’s crisp flesh and mild flavor make it a favorite for cucumber salads and sandwiches. Straight 8 is an heirloom so you can save its seeds. Once most of your harvest is in, leave a cucumber on the vine and let it turn yellow. Pick it, scoop out the seeds, clean them off then dry them, thoroughly. Refrigerate and use next year. If you don’t have a lot of space to garden in or you’re working with container gardening, you can try a couple of the bush cucumbers. They’ll still give you long, green slicing cukes but they’ll take up much less real estate doing it. Bush Crop – these plants are ideal for small gardens or containers. The Bush cucumber produces the same size cukes as it’s bigger brothers – 8 to 12 inch long – but it does it on a dwarf, mound-shaped plant. There are no runners, either. Fanfare is a hybrid but oh what a cucumber it is. It’s got it all, great taste; high yield, extended harvest and disease resistant, the Fanfare produces fruit on compact vines. It’s a great choice for someone with small gardening space or the container gardener. The cuke is slim, dark green and grows to 8 to 9 inches long. And it has a wonderful, sweet cucumber taste. Salad Bush is another hybrid but it matures in just 57 days. This tomato plant only grows that are 18 inches long but it still produces beautiful straight, 6 –plus inch long, dark green cukes. The seed is a bit expensive but if you’re garden space is small or your raising cukes in pots, this may be the one you want to try. Direct seed the Salad Bus and sit back and wait for your beautiful, compact bush to produce beautiful, flavorful cucumbers for your table. Pickling cucumbers are smaller, have more spines and hold up to brining better than slicing pickles. But I think of the pickling cuke as a “two fer.” You can pickle them; you can also slice them and eat them right off the vine! Here are a couple that you might want to consider but don’t limit yourself to just these varieties. The Bush Pickle is fast to harvest – producing fruit in just 48 days. It’s another compact plant so it’s good for container growing – no need for trellises or stakes! The Bush Pickle may be small but it produces a good-sized crop while taking up just 3 to 4 feet of space. The fruit is about 4 inches long, light to mid-green, with a crisp, tender flavor – perfect for pickles! Carolina (Hybrid matures just one day after the Bush Pickle, taking 49 days to produce its straight, blocky fruit. The Carolina has medium-sized vines so you may want to trellis the plants. Vigorous, with great yields, the Carolina produces medium green fruit that are generally about 3 inches long and a bit blocky. The Carolina comes with spines, too and makes a great dill pickle. Cucumbers are usually started from seed. 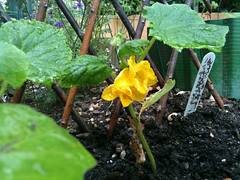 Like their relatives, squash and melons, cucumbers like warm soil so only plant them after all danger of frost is past. In fact, I don’t plant my cukes until almost the end of May. They have to have warm soil and planting them early just means the seed may not germinate. Or if they do, growth will be slow and the plants will be small. So, wait for the warm soil and warm air before putting cuke seeds in the ground. The same is true for transplants. But transplanting cucumbers is a bit tricky. “Cucumbers resent transplanting.” I laughed out loud when I read that sentence in Moosewood Restaurant Kitchen Garden: Creative Gardening for the Adventurous Cook . Then I transplanted some by pulling them out of their little plastic pots and shoving them in the ground. Needless to say the seeds I planted in the ground on the same day grew a whole lot faster than the transplants. Apparently, cukes have lots of little tendrils – small branches off the central root that uptake water and nutrients and feed the plants. Harsh transplanting damages the branches and the plant may not recover, at all. But since I like to have a jump on the growing season, I have worked out a way to do the least damage to the baby cuke plants while giving them about a 6 week jump on being put out in the ground. NOTE: when transplanting into the garden, do NOT remove from the peat pot. Just dig a hole deep enough to accommodate the 4 inch peat pot, place the whole pot in the ground and cover with soil. Make sure you cover the top of the peat pot with soil or, just tear the first inch or so of the top of the pot. If you don’t, the wind will blow on the top of the peat pot and wick moisture right off the plant. If you’re using seeds, you can put a single seed in the soil about every 12 inches and cover them with ½” to 1” of soil. Or you can create a small “hill” of soil and put 3 or 4 seeds in each hill and cover with 1/2 to 1 inch of soil and water them, gently. NOTE: you MUST water these seeds daily. If they dry out in the act of sprouting, they die. If using the hill method. Leave 24” to 30” between each hill to give the plants a chance to grow without being crowded. If you’re using transplants, plant them in warm soil about 12 inches apart. I usually put transplants on one side of the trellis I use for cukes (actually an antique bed spring I found by the side of the road) and put seeds in on the other side. This ensures that I have a longer picking season and, if I lose a plant or two to cucumber beetles, I have others to replace it. By the way, unless you live in Maine or Canada, you can do a second planting for fall harvest by planting seeds in mid- to late summer. Make sure you water cucumbers frequently. They have shallow roots and have to have moisture, especially when they are setting and maturing fruit. Try to use soaker hoses for cukes, too. Cucumbers also like mulch – something that keeps the soil warm in early spring. And floating row covers can help keep your baby cucumbers warm, too. Once the cucumber transplants have settled into their new home, you can side-dress with nitrogen fertilizer when the plants begin to vine. Be careful not to handle cucumber plants when they are wet as you can transmit diseases from plant to plant that way. I only harvest in the afternoon, after the sun has dried off the leaves, top and bottom. If you’re a gardener, killing is in the cards. If you’re an organic gardener, you will kill, too. But you won’t kill indiscriminately. Your Weapons Of Mass Destruction (WMD) will be kind to you and your family and kind to the environment. WARNING: THIS IS A LONG POST…but worth the read. Oh and some of the ideas are gruesome…but they work. Let’s start with an easy weapon you’ve heard about before – insecticidal soap. Insecticidal soap is a good way to try to control pests before they get a foothold. You can use dishwashing liquid for your base because it is mild and, used in small quantities, won’t damage the plants. The soap enhances the ability of the other additives to stick to the leaves of the plant for a bit longer. Soap also dehydrates the bug’s cell membranes and speeds their trip to bug heaven. One word of caution, don’t use too much soap. If you do, you could kill your plants right along with the bugs. Here’s a base recipe for making insecticidal soap that may discourage your pests including the cucumber beetle. Put the garlic, onion and pepper in a blender or food processor and liquefy. Steep these ingredients for an hour. Stir the blended mixture into a gallon of hot water. Stir in the dishwashing liquid. Cover and let it stand for two days so the bits of garlic, onion or pepper flakes settle to the bottom. Strain again, stopping about an inch from the bottom to keep the bits of garlic or pepper flakes on the bottom of the jar from flowing into the newly strained liquid. Pour the liquid into a spray bottle and spray affected plants thoroughly to discourage bad bugs! Like any good general who goes to war, you can’t just rely on one weapon. There are a few more that really took me a couple of years to come to grips with. Before gardening, I was a wimp. If a bug of any variety crossed my path, I drew myself up to my full 64 inch height, screamed and ran. Oh, yes I did. Then I became an organic gardener. Bugs moved from the nuisance category to sworn enemy. And my arsenal expanded to include some pretty weird (and previously unthinkable) weapons. Rocks are a favorite. They’re cheap and readily available. And they’re effective. Just hold a rock on either side of a squash leaf that’s harboring stink bugs and bring them down quickly, bashing the brains out of the vine borer before it lays eggs or pokes holes in your squash, cuke or pumpkin stems. Oh, and make sure you check the bottoms of the leaves of your zucchini, summer squash, cucumbers and pumpkins for eggs. Once you see a stinkbug you can be sure you have a little batch of bright orange eggs stashed somewhere on the plant. Find them, crush them and move on. Hands do the job with a bit more finesse than rocks. Okay, it’s a bit gross to grab a bug and squash it with your bare hands. But smaller beetles like cucumber, asparagus and Mexican bean beetles are much more agile than stink bugs so rocks rarely work. NOTE: be prepared to spend a bit of time every afternoon or evening catching and crushing these beetles. I used to come home from the office, change and go out and vent all the pent up hostility of handling my staff, my peers and my bosses by crushing as many bugs as I could find. Finding these winged pests and their crawling, larval offspring means taking the time to shake each plant. When they fly up and land again, squash them between thumb and forefinger while perhaps reciting the litany of crimes your co-workers have committed and the punishment you are meting out. Be methodical. Flip the leaves of every plant over to look for larva and eggs. This is especially important for Mexican bean beetles. “Where there’s one,” my Mom used to say, “There are a million.” So be ruthless. Think sheer volume and crush away. There are some bugs I just will not tackle, bare-handed. When the Japanese beetles and their cousins, the Asian beetle and the Green Fruit beetle (looks like a Japanese beetle on steroids) come calling, I break out my slotted spoon and a pot of cold water. Weird weapons of choice for dealing with flying beetles that can hook to your clothes and get caught in your hair but, believe me, they work. There’s just one trick. You have to go out to the infested plants early in the morning, as dawn breaks and before the sun begins to warm the air. These beetles are heavy sleepers and don’t start stirring until the sun is up. So it’s really easy to whack them into the pot of water with the spoon and wait for them to drown. Or if you’ve got chickens, set the pot in the coop and stand back. It will look like a Japanese horror movie as the chickens move in to eat their fill. This is a trick my Mom taught me. She raised a lot of cole crops – cabbage, broccoli, brussel sprouts. And these plants were really plagued by things like the codling moth. Well, Mom showed me how to use morning dew, white flour and a sifter to turn the moths and their larvae into – well, how can I say this – papier mache bugs. The flour and water mixed together to create a paste that baked in the sun and froze this insect enemy into tiny sculptures that could no longer chew their way through my plants. By the way, this also works for flea beetles. Here’s another ingredient from the kitchen that works, all on its own, to help control roly-polies, earwigs, and some of our other not-so-welcome bugs. And it’s simple and cheap (my favorite combination). Sprinkle chili powder under targeted plants. It doesn’t hurt the plants but it sure does make the creepy crawlies take off and never come back. Diatomaceous earth is a blessing for any gardener plagued by slugs. And if you plant tender lettuce and young pepper plants, you will probably have slugs coming over for dinner every night. Like the trick for killing codling moths, I tend to put the diatomaceous earth in the flour sifter and sift it gently over the affected plants but don’t inhale it. It can hurt you, too. I also use a spoon to lay down little circles of diatomaceous earth around the stems of my plants and around the outside of the lettuce plants. Diatomaceous earth is made of the sharp, jagged skeletal remains of microscopic creatures. It acts like finely ground glass and lacerates soft-bodied slugs causing them to dehydrate. I don’t want to be sexist here and I was going to write grandchildren but I just could not get my granddaughter engaged in this particular game. I paid my grandsons cash on the barrel head for Japanese beetle bodies. And they earned a considerable amount of money some years by just banging the beetles into a pot or crushing them with rocks. Some of the tactics seem downright cruel but, remember, this is war! There will be days when you are on the battlefield, armed with your weapon of choice and you’ll still feel a bit like David to the insect kingdom’s Goliath. Take heart and smash, bash, drown and pick until you’ve cut into the insect front line troops. And remember that resisting a quick squirt of pesticide means knowing that your food will not kill you, your family or your friends. Got any weird or wonderful ways to control bugs, organically? Please share them! Next week, composting successfully. Composting always sounded like it required a lot of work and a pretty good dose of luck. I’ll show you just how easy it can be. The first set of tools I suggested are all useful for any gardener. But I’m a practical organic gardener so I love the fact that most of them are found, free or inexpensive. This set of tools are nice to have and will make your life a bit easier but you don’t need them to be an organic gardener. If you’re new to the hobby, you might not want to invest in anything but the necessities until you know if you like gardening. If you try gardening and like it, you can start looking over this list and pick out the tools you think you would like to add to your collection. A kneeling pad – you can make one of these or buy one. I’ve had my small green one for more than 15 years and it really, really saves your knees! Gloves – I consider these nice to have because you really can dig in the dirt, bare-handed, and suffer no ill effects. In fact, I don’t use gloves because I love the feel of soil in my hands. Two hand tools – both of mine are Fiskars because of the grip, the design and the lifetime guarantee. The first tool is the “Fiskars 7079 Big Grip Garden Knife . The second tool is the Fiskars 7073 Big Grip Trowel . A pitch fork – used to move the straw back from the fence sections a couple of weeks before planting so the soil can warm a bit. Also handy when digging up potatoes or garlic or spreading mulch. A watering can – very nice to have if you want to hand-water fresh transplants or apply liquid fertilizer. Peat pots – I use 2” and 4” peat pots and hate paying the price for them. But they make transplanting easier for me and less stressful for the baby plants so I pay. Tip: I try to get them online rather than in a big box store where the price is always higher. A sharp knife or pair of scissors nicked from the kitchen – nice to have on hand to cut baling twine and great for cutting off produce rather than trying to pull it off. Having lost several battles with eggplant and peppers, I tend to keep a sharp knife in my garden basket and use it with malice aforethought. A good bug book – this could be one of your larger expenses but, believe me, you will be grateful for putting out the cash. Why? There are a whole lot of good bugs in the garden that will do battle with the bad ones without you lifting a finger. But, if you don’t know the good from the bad, you could be killing your soldiers and giving the enemy a chance to overrun the battlefield, i.e. your garden. I bought Garden Insects of North America by Whitney Crenshaw and the up close images of bugs help me identify what I’m battling. Soaker hoses – using soaker hoses saves water but they can also slow down or stop soil-born diseases that are spread by spraying and bouncing water on plants. And I found and use what I think are the best soaker hoses in the world just last year – the Gilmour Flat Soaker hose. A small propane torch – the handheld kind – I use this to burn tent caterpillars off my fruit trees. It’s a bit brutal but it burns the nest and the caterpillars before they can strip my trees. Oh, and you can use it to burn out poison ivy, too. Raised beds – I make mine with 2 x 12’s (NOT pressure treated) and plastic anchor joints from Home Depot. A good pair of secateurs like Felco F-2 Classic Manual Hand Pruner. These hand held clippers can cut through a 1” branch like it was butter. They let you trim inside the plant, bush or tree instead of hacking off the outer foliage or branches. These lists contain all tools I consider nice to have if you want to move beyond dabbling in organic and decide to grow most of your produce every spring, summer and fall. Bit of advice? Before you buy any of these items, look on http://freecycle.org or http://craigslist.org to see if you can get them for free or cheap! Tell me about your favorite gardening tools and why you like them! Next week, how to handle being bugged without using pesticides. I call this section in my book, “Practical Organic.” Why do I think organic gardening is practical? Just this. Unlike traditional gardening, if you go organic, there are a lot of things you will NEVER have to buy. So, you can garden happily without most of them but there will be some challenges. Next week, tools that are “nice to have.” These may cost a bit up front but may also save you a lot over your lifetime as a gardener.